Tokyo, February 1, 2016 – Fuji Heavy Industries Ltd. (FHI) today announced that its Industrial Products Company has redesigned the flagship Subaru EX Series general-purpose engines. The new models will be showcased at World of Concrete, the world’s largest annual event dedicated to the concrete industries, which begins on February 2, 2016, in Las Vegas. 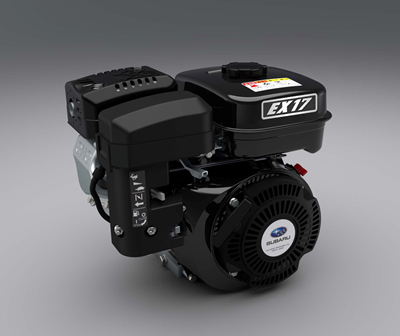 In addition to a new exterior design, the new EX Series engines offer enhanced performance and gear reduction options to meet a wider range of customer needs. The start of sales is scheduled for April 2016. The EX Series started out with four models in 2001, followed by two more in 2007 for a total of six models. All engines in the series adopt overhead cam (OHC) technology, achieving superior performance and durability as well as environmental excellence. The proven durability has earned this series wide use in the construction machinery industry and in a variety of products from generators to pressure washers. The black exterior color of the EX Series has been changed from matte to semi-gloss*2, and a grain finish has been added to part of the air cleaner. The design has been standardized across the entire EX series for a more unified look and an enhanced quality feel. Metallic look of the label material is heightened to express durability and advanced engineering. ・Performance has been raised by improvements to the cylinder head intake port design, muffler structure, and other areas. ・To better meet the needs of customers, especially those in North America, external reduction gears have been added to the EX17 engine lineup for 2:1 speed (with clutch) and 6:1 speed operation, mainly for use in industrial and agricultural machinery. In addition to World of Concrete, the Rental Show, the world’s largest annual convention and trade show for the equipment rental industry by the American Rental Association, will be used to showcase the new EX Series models including the EX17 engines with 2:1 (with clutch) and 6:1 reduction gears. *2: For non-black color models, changes to the air cleaner and model label apply. *4: Sales start of models with reduction gears: October 2016.